Lotus Fields. This fabulous new villa is situated in a small development in Huay Yai 5 minutes from Sukhumvit Road, and 10 from Tesco Lotus south Pattaya. Set on a 364sq.m land plot (91 talang wah) it provides all the necessary ingredients for a relaxing family home. The very spacious 190sqm home includes three double bedrooms with 2 of these having their own en-suite bathrooms and pool views, plus an additional guest bathroom off from the living room. The kitchen/breakfast room has a fully fitted high spec European kitchen with built in oven and dishwasher (FRANKE appliances), plus the open plan lounge/diner, and all rooms have ECO lighting and air conditioning (3 in total). Outside, the villa has open patio space, and a private swimming pool, and waterfall. The houses are being built by a UK developer with over 25 year’s experience, and finished with smooth plastered Q-con insulated brick walls, roof insulation, UPVC windows and doors, earthed 3 phase electrical mains for lighting and power, air conditioners, and reserve water system. 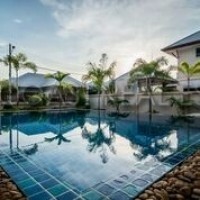 This home is already transferred into a Thai Company so it is now very easy, and cheap to purchase and own this property.